We provided a Parent and Toddler Group for parents and their children with disabilities which takes place at our premises in the East End of Glasgow. They meet weekly for 2 hours in a safe, fun environment giving parents and children the opportunity to be with others in a similar situation. 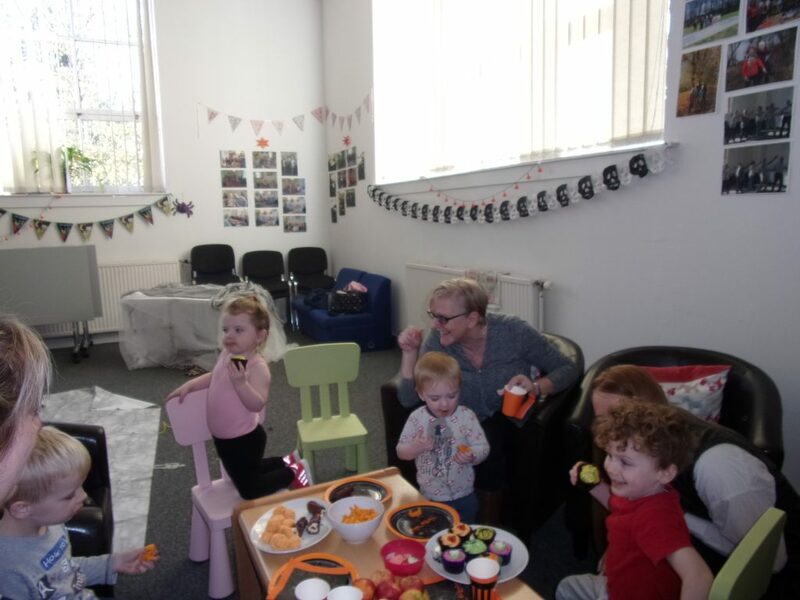 To extend the current service provision within the Carers Hub, a new project providing ongoing support to carers in the east end of Glasgow, we developed a Parent and Toddler Group for children under 5 years with disabilities and their parents. From conversations with our carers and other professionals we recognise that these parents often feel isolated from other parents in a similar situation and are reluctant to engage with services like the Hub as they may not yet recognise that they are a carer. Our carers also tell us that accessing mainstream groups can be difficult as other parents may not understand their child's condition and how it may affect them, particularly in relation to their behaviours, communication and ability to socialise with their peers. The group met weekly for 2 hours for 40 weeks over the year and we also organised 2 family events. In order to coordinate and organise the group and any activities taking place we recruited a Coordinator and 2 volunteers all with extensive experience of working with children with disabilities and their families. We purchased specialised play equipment and also provided various activities to assist with sensory play, communication and simply having fun. Children also had access to our sensory room which provided the opportunity to disengage from the larger group if a child became anxious, stressed or suffered from sensory overload and where appropriate for sensory stimulation. Referrals came mainly from nurses at our local Child Development Centre, health visitors and word of mouth as parents heard about the group. Referrals included several from under-served groups including Black Minority Ethnic parents and their children. Successes for parents included feeling less isolated and stressed, increased confidence and accessing peer support which extended beyond the group itself including engaging with other services and activities of the Hub. Success for the children included being able to socialise and play with other children. Challenges included the natural turnover within the group as children accessed nursery and the impact of the long summer break on group continuity. Targeting families most in need of support, The Carers Hub is a new project aimed at providing ongoing preventative support to carers in the East End of Glasgow. Many of the parent carers using the services and activities of the Hub often came to us when they were experiencing a crisis situation. Because of this we began to think about how we could engage with them as early in their caring role as possible so they could access support, advice and information to make them better informed and knowledgeable about their child’s condition, access peer support and feel less isolated and stressed. From this the idea of a playgroup specifically for parents and their children under 5 years with disabilities began to form. Many of our parent carers had already told us accessing mainstream groups was often difficult so developing a Parent and Toddler Group as a new service within the Hub made sense. In the first 12 months of the project parents attending the group have developed relationships with Hub staff and have been able to use other services and activities within the Hub and there is the real feeling of a community of parent carers which extends beyond the Hub itself. Parents have told us they ‘feel at home’ and ‘feel part of a wider family’. Reaching out to and engaging with new families, developing the Parent and Toddler Group has allowed us to engage with families early in their caring role, particularly single parents and Black Minority Ethnic parents within our local community in the East End of Glasgow. We have learned much more about the challenges parents of children with disabilities face every day but particularly these 2 groups. Isolation, high levels of stress and for many of our Black Minority Ethnic carers lack of understanding of their child’s condition within their own community are some of the issues they face. Lack of confidence was also mentioned by almost all our parents. Many of the children had an autism diagnosis and due to lack of understanding of how autism affects someone reactions to their child’s behaviours is almost always negative and can feel judgemental. We already had good links with our local Child Development Centre and many of our referrals for the group came directly from them. Moving forward in to year 2 we know we need to find better ways to have these referrals translate into parents and children attending the group. If possible a joint home visit with CDC staff at point of referral could be beneficial and make that first step easier or if not possible or practical a home visit by the Hub Manager and/or Playgroup Coordinator could be carried out. Referring staff could also bring families for a visit to the group. Hopefully these practical solutions will make it easier to reach an increasing number of new families. Dealing with unexpected challenges and opportunities, at the point we received funding from Better Breaks for our project we already had a significant number of referrals. However, some of these referrals had been made to us many months before and by the time we received funding some of the children had been provided with substantial nursery places. It also quickly became apparent that parents and children would find it difficult if not impossible to attend every week. This was for a number of reasons including ongoing health issues due to the child’s disability, frequent and regular health appointments, other service involvement e.g. Home Support Teacher and for many of the children with autism they may experience high levels of stress, anxiety or sensory overload which made attendance difficult. Parents also may be trying to juggle work and other children. We had also decided the group would be term time only as within the Hub our parent carers tend to either disappear or have limited contact with us during school holidays. This did however create a problem with continuity and from discussion with parents we have extended our provision in year 2 to include some playgroup sessions during school holidays. We will have met our target of 15 parents and their disabled children living in the East End of Glasgow attending our weekly playgroup and 24 parents, their disabled children and other siblings attending two family events. Over the period of the project we had a total of 16 parents, 3 grandparents, 15 children with disabilities and 3 younger siblings attending the playgroup. Our family events had smaller numbers but were hugely successful and 10 parents, 3 grans, 9 children with disabilities and 5 siblings attended. Within the playgroup we were able to offer a wide variety of toys and play equipment as well as various activities involving sensory play, messy play and art, storytelling and music. These were successful by providing the opportunity to increase appropriate play opportunities and assist communication, learning and development. Due to lower numbers we provided 2 trips for our family events, one to Amazonia and soft play at MandD's and the other to the Science Centre with a' Bubble-ology' workshop and access to all the activities within the Science Centre. These were both experiences our families were either unable to afford due to costs, transport issues or lack of support. 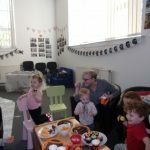 The Parent and Toddler Group aimed to provide a range of equipment and activities for disabled children taking account of the needs and range of disabilities within the group. Advice was taken from other professionals and the parents about the toys and activities their child would enjoy and benefit from. Sessional workers were sourced to provide particular activities, all of whom had experience of providing these activities to children with disabilities. Play sessions provided involved sensory play, messy art and play, storytelling and music. A Playgroup Coordinator and 2 volunteers were also available to support younger siblings and allow parents the opportunity to participate fully in the interactive sessions with their disabled child. Our sensory room was also made available to children attending the group to help alleviate anxiety, stress and sensory overload. It also provided the opportunity to relax or engage in activities to assist sensory stimulation. An example of a positive change for one of our parents and their child who has multiple complex needs, they were able to enjoy together play activities where he was able to participate and enjoy a variety of sensory stimulation. He particularly enjoyed music, sensory play and messy play and mum was able to take some of these back into the home environment. He also loved the sensory room and always showed an amazing reaction when he spent time there, smiling, laughing and sometimes relaxing and falling asleep. His mum has now purchased some smaller versions of some of the equipment he enjoyed for his bedroom at home and she said he is more relaxed and sleeping better. Parents will experience improved physical, emotional and mental well-being. Many of the parents attending the group are either single parents, Black Minority Ethnic parents or are isolated due to lacking the confidence to join groups due to other parents making judgements about their child's behaviours, communication or lack of ability to interact or socialise with their peers. As a result they suffer from high levels of stress. Coming along to our group has benefited their health and well-being as they are among other people in a similar situation who understand their situation and they can access not only peer support via the group, opportunity for a cup of tea and a chat, but also emotional support from staff at difficult times. They have had the opportunity to access individual massage and pampering at the groups or at our regular parent carer cafes, as well as many of them accessing training, information sessions, health and well-being activities and peer support groups. Hub staff also have provided help with benefits, and access to various grants. One of the parent’s attending the group has two children with autism, one who attended our group and the other in primary school. When she started coming to the group she described how overwhelmed and lacking in confidence she felt. She had stopped attending other group activities with her children due to other parents’ reactions to her children’s behaviours. She said she felt judged as a parent. The first few weeks both she and her child attended the group they would only stay for around 30 minutes but in a short time this increased to 1 hour and then to attending the full session. Both she and her child were relaxed and happy and she enjoyed having the opportunity to chat with other parents in a similar situation. She also built up a relationship with staff and could access emotional support at difficult times. She also felt confident enough to become involved in other Hub services including condition specific training, information sessions, peer support groups and cafes and benefited from some individual massage sessions and pampering. Most recently her older son attended a 6 week pilot we had of an after school club which was a huge success for both of them so much so she took pictures to show his school teachers. As a result of all these positive experiences she felt less stressed and isolated and much better equipped to continue in her caring role. A few weeks ago she walked over 20 miles in the Kilt Walk to raise funds for the Hub. She said although she felt like giving up at several points she kept going as she wanted to raise money for an organisation that never gives up on her family. Although parents attended both the group and the family events with their children we were able to provide opportunities for them to get a break in both situations. By having sessional staff and volunteers as well as other staff providing organised, structured activities parents had time for a cup of tea and a chat with other parents and the chance to relax albeit for a short period. They also had the opportunity to enjoy massage and pampering sessions. At both the group and the family events we endeavoured to take us much stress out the situation as possible with staff taking on all organisation of both, making teas and coffees and creating a relaxed and happy atmosphere. Most importantly parents told us how good it was to be in an environment where both other parents and staff had an understanding of their child’s condition and disability. All our parents experienced isolation, stress and the feeling of others not understanding their situation. They were often on their own with little support, juggling looking after their child with a disability and their siblings and often also trying to stay in employment. They told us about having little or no time to themselves, lack of sleep and little opportunity to have any break from their caring role. Our Black Minority Ethnic carers also had the difficulty of lack of family support and not just lack of understanding of their child’s disability but being shunned by their community in some instances. One of our Black Minority Ethnic parents had married a UK citizen but found herself thousand of miles from family and friends. When her only child was diagnosed with autism she was devastated and completely overwhelmed. Her husband is the family breadwinner and works long hours mostly in the evenings and weekends giving her little opportunity to have a break from caring. Accessing the playgroup and other Hub services has been a lifeline for her. She has been able to access peer support, make friendships and recently has received a budget for her daughter which will give her a break from caring on a regular basis as well as extend opportunities for her child. She now feels as a family they are in a much more positive place. 15 carers (plus family members) will have increased confidence, established relationships with Carers Hub staff and feel better supported, informed and knowledgeable about their child's condition and needs. When we had the idea of developing the Parent and Toddler Group one of our main aims of doing so was to try to provide local families and their children with disabilities with the opportunity to engage with a service like the Carers Hub as early as possible in their caring role. Many of our parent carers have sought support from us when they have experienced a crisis situation and without exception tell us they wished they had known about services like the Hub at a much earlier time. In the past year the majority of our parents have engaged with other Hub services and activities, many of them using several of our services including training, peer support groups and cafes, sensory room, help with benefits and forms and most recently several fathers coming along to our new group for dads/male parents/carers of a child with autism. One of our parents has 2 children with disabilities along with 3 older children. Both children with disabilities are pre-school and one has particularly complex needs. When mum met us, she was extremely stressed and exhausted. She finds it difficult to attend the group regularly due to numerous appointments and the health of one of the children. We were able to help her access a grant for driving lessons, the family don’t have a car which will be helpful for the whole family and make attending appointments much easier when they get transport. She was also provided with support with a housing situation and support to deal with other agencies. The whole family attended both our family events which would have normally been financially prohibitive and we were able to provide transport to make the experience stress-free. Both she and her husband have started attending peer support groups and she has managed along to some recent information sessions. As a result they feel supported by us as a whole organisation and feel more able to sustain their caring role. 15 parent carers, their children and other family members will have increased confidence to access mainstream activities. This is the outcome we feel we have not been able to fully meet. This is most probably due to the young age of the children and parents still building up the confidence to look to mainstream activities for their children. Some are still bruised by their previous experiences. Where we can demonstrate success is via our 2 family events. The first event was a trip to Amazonia and soft play/bowling at M and Ds at Strathclyde Park. The second was a trip to the Science Centre including a Bubble ology’ workshop. At both events we provided lunch and snacks for everyone. We obviously organised all elements of the day and provided support but several parents commented that they may try something similar in the future. Their confidence was increased by the helpfulness and understanding of staff at both venues. One of our families very rarely manage to go out as a family to places like those we organised for our family event. Two of the children have disabilities and they have 3 older children. Cost is an issue but being able to meet the needs of all the children is also a concern. The younger children require a lot of attention and support which can naturally leave little time for the older children. The family attended both family events and gran came along too to provide extra support at the 1st event. On the day dad was able to spend some time bowling with the older children and mum and gran had a chance to relax while 2 staff members supported the younger children in the soft play area. At both venues staff were aware we were a group with children with disabilities and went out of their way to provide as much help and support as possible to make the days a success. Hopefully seeing this families like the one mentioned above may feel more confident trying mainstream activities and asking venues for help to make the day less stressful and a good experience for the whole family.